Cheese wheel pasta has finally hit Brisbane! Don’t lie – you know you were drooling on your keyboard when videos of spaghetti being twirled around in epic cheese wheels and infused with cheesy goodness start circling the foodie web. But there’s no need to trawl YouTube any longer – cheese wheel pasta has come to Brisbane! Holy. Cheesus. Yep, our prayers have been answered, and this delectable dish will be taking over new Italian spot Il Verde in Bowen Hills every Tuesday and Thursday night at 6pm and 8pm. $45 will get you carbonara served up straight from a parmesan wheel, a glass of wine and dessert – although we really just wish we could take the leftover cheese wheel home. For those who literally have no idea what we’re talking about (um, where have you even been?? ), cheese wheel pasta is just that. 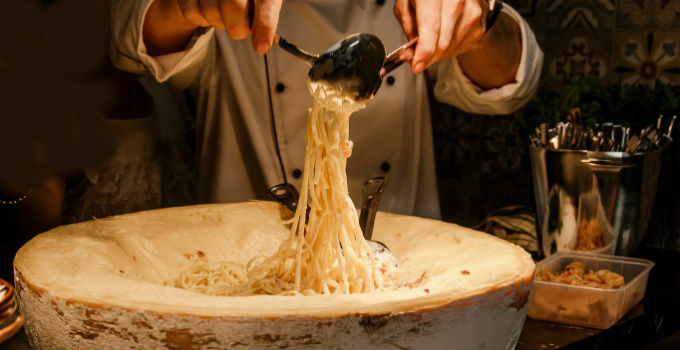 A ginormous wheel of parmesan cheese is scooped out to form a bowl, and perfectly al dente hot pasta is gently spooned into the wheel and coated by melting cheese as it gets stirred around. *drools prolifically* We’ve already booked ourself a spot to get some seriously cheesy pasta in our gob for at least the next 6 months – and you should definitely do the same. They’re taking bookings by phone only – call ’em on (07) 3638 0494 to book. You’ll find Il Verde at 2 King Street, Bowen Hills, with their cheesy nights on offer every Thursday and Tuesday.